I wasn’t planning on painting in town today. I have a few paintings here in the studio that I was planning on finishing. However, when I walked into town this morning to go to the market, I ran into a few amigos I have gotten to know. One man appears to be a city worker. He cleans the streets and the parks, and when I walked by him today he asked me in Spanish if I was going to be painting today. I said no, I was just going to the market, but that I would be painting in town tomorrow. He told me he wasn’t going to be here tomorrow, with obvious disappointment. He wanted to see a new painting come to life. Further down the street, I ran into another friend, also a city worker, who asked me the same question: Are you going to be painting today? That settled it, and my reply from then on was “En dos horas,” or in two hours, I would be back. I am starting to feel like a local and people are recognizing me as the man who paints in town. A fellow artist and I took the thirty minute bus ride into San Jose yesterday, which is the largest city in Costa Rica and filled with people and energy, and even there we ran into a friend from Ciudad Colón, who also stopped by today to see the progress of the new painting. I walked back to town today with my gear and set up in the park. Both of the city workers were excited to walk by and see the new painting coming along, and hung out for quite some time. One man walked by with his three small children. They stopped to watch me paint for awhile, and asked where I was from. “Estados Unidos,” I replied, Spanish for the United States. The man spoke to his children and pointed to me and said, “Un Gringo,” and they giggled. I pointed to myself and repeated, “Gringo,” and laughed myself. Costa Ricans refer to themselves as "Ticos" and to Americans as "Gringos." I gave the children small pieces of charcoal to draw with, to the partial dismay of the father. People are always happy to see one make an effort with Spanish, and they are also happy to practice English, and it is always charming. A police officer walked by and said, “Hello sir, have a nice day,” which he meant as a greeting, and shook my hand. 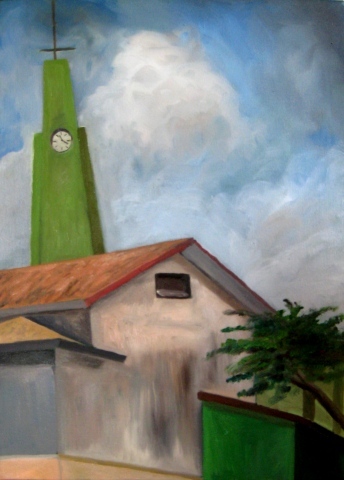 This image is of a building associated with the town church, with the church steeple rising in the background, and would be instantly recognizable to the residents of Ciudad Colón, as the church is one of the centers of life for many Costa Rican cities.